The Voodoo Doll – Raised yeast doughnut filled with raspberry jelly topped with chocolate frosting and a pretzel stake! Had to add this sign…this place was one of our true 2016 highlights! You know the place from TV – Home of American Pickers! Yep, shed the clothes and hop into the roadside spa. I did this for a Japanese TV show in 1988. One of the BBQ Masters at Arthur Bryant’s shows off the goods! The year 2016 was not a banner year for travel for me as there were no super long cross country trips taken like I had done form 2012-2015. However, over the course of the year we did take a number of smaller trips and a couple of fairly long trips. I visited 11 states during the year and made it to some places where I hadn’t been for nearly 30 years. Even made it into towns from A (Abingdon, VA) to Z (Zanesville, OH) and one with an X too (Xenia, OH)!! During the course of the year we visited a few major cities including Cleveland, Pittsburgh, Washington DC, Houston and the Dallas-Fort Worth area. We also visited Nashville and Memphis in Tennessee. A good portion of my travel in 2016 was related to rails to trails bike trails that my wife Julianne had desired to ride. We visited some lovely bike trails in Ohio, Kentucky, West Virginia and Virginia. While Julianne rode, I would take the back roads and meet her along the trails. This was until I got my own bicycle on my birthday in October. We took one flight during the year which was to Houston to celebrate a calling for my son in church and to visit our grandsons. In late October, we also drove to Fort Worth, Texas for the funeral of my father. Not as joyous a trip, but we did visit a few locations along the way for fun. Our trips to Cleveland and Pittsburgh were predominantly because Julian sister Laura had moved from Idaho to the Pittsburgh area. So she met Julianne on a couple of the bike ride trips. She and Julianne also attended a conference at the Kirtland Temple and while they were there, I visited my family in Little Italy in Cleveland and also took some tours around the city with my sister Tina and her husband Jim. Then we visited Laura in Pittsburgh, we got to see a number of wonderful things in Pittsburgh including the Monongahela Incline, hey unique rail type system that pulled us up to the top of Mt. Washington where we had spectacular views of the city of Pittsburgh and the three rivers down below. The year ended on a high note as we took a long trip to Ocean City, MD where we stayed with Julianne’s sister and her husband Richard and their daughter for about a week on the beach. It was a wonderful trip! It was during this trip that we also visited Washington DC and the large LDS Washington DC Temple with all of its amazing Christmas lights. I also made my way up to Bethany Beach and Rehoboth Beach in Delaware, both of which I had not visited since the 1980s. I think I counted about 12 themed mini golf places on the main drag in Ocean City, including dragons, pirates and dinosaurs. Of course, whenever we take road trips I always try to find the unique and the unusual whenever possible. And most of our trips were not immune from my searching to do so. On our trips visited such wonderful places as Friendly, WV, Prosperity, PA, Novelty, OH, Happy, KY, Eighty Four, PA and a few other unique named towns as indicated in photos below. I even located a Yellow Brick Road in Ohio and a Bliss Happens Lane in Maryland! Made it to Hope, AR, just before the 2016 elections. Hope is the home of former President Bill Clinton. During the year we often ate at places that were focused on bicyclists and motorbike enthusiasts. One such location was in Oregonia, OH. It was way out of the way to get to. 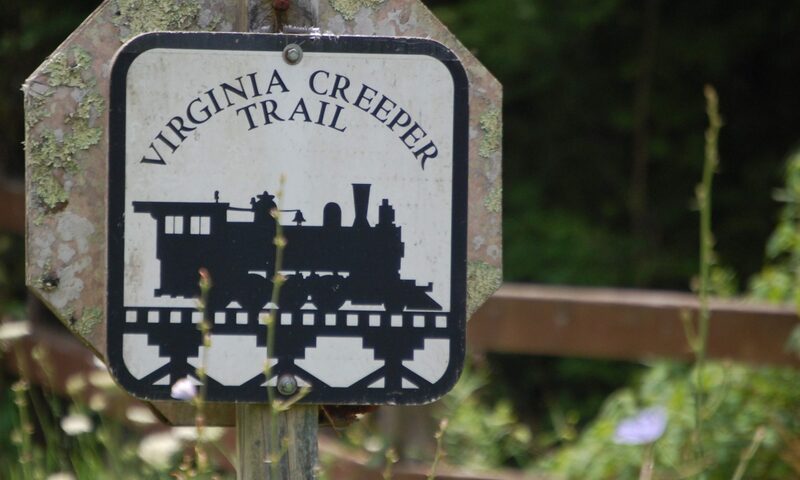 Then there was the place on the Virginia Creeper Trail which was almost impossible to get to my car but was built specifically for the bicyclists coming down the Virginia Creeper Trail. In August, we got to visit Nashville and hang with my good friend and musician Antsy McClain. He took us around with a few other “field trippers” and showed us some of the sites of Nashville including music Row, some music dives and some good places to eat including the oldest diner in Nashville. We also have the unique chance to sit in a recording studio with Antsy and sing back up vocals on one of his songs! During the course of the year, I also took a few “staycation” trips within Kentucky. This included one on the bike trail with Julianne, but also to Ravenna, where I visited hey famed café called the Wigwam. I also took a fun trip with my grandchildren and my daughter Marissa down to Cumberland Falls and then on into Corbin to visit the Harlan Sanders museum and restaurant which is where the recipe for Kentucky Fried Chicken got it start. During the fall I took a solo trip up into Red River Gorge to get pictures of the fall colors. I was about a week too late to get most of them, but that was because we were in south eastern Virginia on the Creeper Trail to see the beautiful colors down there. Visiting Cumberland Falls with my daughter and her kids. Some of the other more unique places that I got to see over the past year would include the “Birthplace of Superman,” which was in Cleveland, as well as the house where the movie “A Christmas Story” was filmed. Also while in Ohio, I visited the world’s largest geodesic dome in Novelty, OH. That was fascinating. Of course, I can’t neglect to mention the visit to Little Italy to see my birthplace and family. I ate fine Italian cuisine at Mama Santa’s and had a great time seeing other sites there. Its the best Little Italy in the US! During the year I also visited two fast food restaurants that had included museums in them. The Wendy’s restaurant in Dublin, OH had a whole section built in there with the history of Wendy’s and a large statue of Wendy’s founder Dave Thomas. In Canonsburg, PA, there is a McDonald’s restaurant that includes dedications and memorabilia of Perry Como and Bobby Vinton, both of whom grew up in Canonsburg. It was fun for me to visit Xenia, OH and see the murals and the architecture and then also travel around some of the other areas nearby with Julianne and her sister and/or our grandchildren who rode their bikes along some of the bike trails including the Little Miami Scenic Trail. We visited the Little Miami Scenic Trail twice and each time had a great time. Overall, I have to say it was a wonderful year. I saw dolphins swimming at sunrise on Christmas morning in the Atlantic Ocean in Maryland. We got to visit some of our great national historical sites in Washington DC. On many of the trips, it was fun to travel with the grandchildren and see the delight in their eyes they saw big waterfalls, giant statues and other interesting places. On a final note, I have to say that we did visit a few interesting places to eat. A great taco place in Houston, and, as I mentioned before, the Wigwam in Ravenna, KY. Also of note were the Crabcake Factory in Ocean City, MD and a Japanese place with a unique name Saketumi, in Rehoboth Beach, DE. As I start a new position in new venture 2017, I look forward to traveling. The new company (PrecisionHawk) is in Raleigh, NC and so I will be taking a trip there in early January. Who knows what other delights I will find in 2017. Visited Moon, PA in 2016. Visited Earth, TX in 2011. Earth vs Moon Police! A Pal’s Sudden Service building. Lots of fun and it looks like the food is great too. The 370 foot long Bridge of Dreams over the Mohican River near Brinkhaven.